(Phys.org) —A new high-accuracy calibration of the LUX (Large Underground Xenon) dark matter detector demonstrates the experiment's sensitivity to ultra-low energy events. The new analysis strongly confirms the result that low-mass dark matter particles were a no-show during the detector's initial run, which concluded last summer. The first dark matter search results from LUX detector were announced last October. 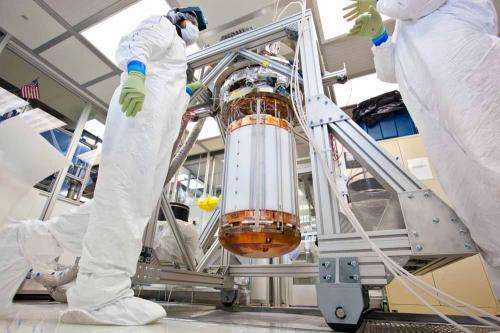 The detector proved to be exquisitely sensitive, but found no evidence of the dark matter particles during its first 90-day run, ruling out a wide range of possible models for dark matter particles. Previous experiments had detected potential signatures of dark matter particles with a very low mass, but LUX turned up no such signal. This latest work was focused on demonstrating the high sensitivity of LUX to potential signals in the search for those low-mass particles. "The new calibration improved our calibration accuracy by about a factor of 10," said Rick Gaitskell, professor of physics at Brown and co-spokesperson for LUX. "It demonstrates that our first dark matter search result, which showed no sign of low-mass particles, is absolutely robust." The results of the new analysis were presented Wednesday, Feb. 19, 2014, at the Lake Louise Winter Institute in Alberta, Canada, by James Verbus, a graduate student at Brown who led the new calibration work. Dark matter is thought to account for about 80 percent of the mass of the universe. Though it has not yet been detected directly, its existence is a near certainty among physicists. Without the gravitational influence of dark matter, galaxies and galaxy clusters would simply fly apart into the vastness of space. It's not clear exactly what dark matter is, but the leading idea is that it consists of subatomic particles called WIMPs, short for weakly interacting massive particles. WIMPs are thought to be practically ubiquitous in the universe, but because they interact so rarely with other forms of matter, they generally pass right through the earth and everything on it without anyone knowing it. The LUX is designed to detect those rare occasions when a WIMP does interact with other forms of matter. The detector consists of a third of a ton of supercooled xenon in a tank festooned with light sensors, each capable of detecting a single photon at a time. As WIMPs pass through the tank, they should, on very rare occasions, bump into the nucleus of a xenon atom. Those bumps cause the nucleus to recoil, creating a tiny flash of light and an ion charge, both of which are picked up by LUX sensors. The detector is more than a mile underground at the Sanford Underground Research Facility in South Dakota, where it is shielded from cosmic rays and radiation that might interfere with a potential dark matter signal. This latest work was an entirely new way of calibrating the detector to recognize a WIMP signal. "One of the important things we need to do is to calibrate the detector for what a WIMP-like recoil would look like," Verbus said. "You want to be able to measure your detector response for WIMP-like events." To do that, the scientists use neutrons as a stand-in for WIMPs. The recoil created when a neutron hits the nucleus of a xenon atom is thought to be very similar to the recoil that would be created by a WIMP. To calibrate the LUX for low-mass WIMPS, the LUX team fired low-mass neutrons directly into the detector and used the detector's instruments precisely measure the characteristics of the neutron recoil. Once the researchers established exactly what a low-mass neutron recoil looks like, they went back to their data from the dark matter search to see if similar events occurred. What makes this calibration method unique is that it was done directly inside the LUX detector. In previous xenon experiments, the neutron calibrations were done in separate test chambers instead of in the detector itself. "Because our detector is so big and detects recoil positions so well," Verbus said, "we can just fire neutrons directly into LUX and get an absolute measurement of energy." The LUX team used this new calibration to double-check the data from the detector's first run. Those initial results were confirmed: There were no low-mass WIMP events in the first run. Along with the low-mass wimps, the first 90-day run of LUX ruled out a wide swath of possibilities for what dark matter could be made of. "There are literally thousands of models of particle physics lying bloodied in the gutter," Gaitskell said of the detector's first results. LUX will expand its search later this year when it begins a second, year-long run searching for new dark matter models at an even greater sensitivity.